the relationship between General Principles and competition law. This book reflects the continuous relevance and the need to re-examine the effects and the status of General Principles of EU law, which have been dealt with already twice before (in 1999 and 2007) by the group that has compiled the present volume, the Swedish Network for European Legal Studies. The discussion that emerges is, here as before, of immense significance both for theoretical legal studies and for legal practice. The eighteen essays here printed are all final author-edited versions of papers first presented at the Network’s conference in Stockholm in November 2012. The authors include both eminent, well-known experts, and representatives of a new generation of younger scholars in the field. For the many parties involved in the evolution of the European project from a legal perspective, this book will serve as a watershed, a thorough inspection of the foundations as they are perceived and understood at the present moment. It is sure to be consulted and cited often in the years to come. 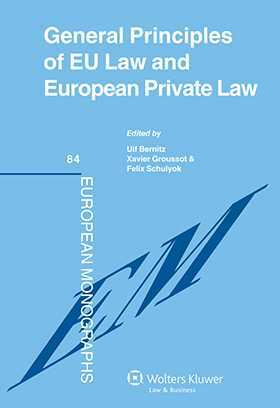 Vision, Essence and Narratives of General Principles and European Private Law: An Introduction, Ulf Bernitz, Xavier Groussot & Felix Schulyok. Part I: Methodology in the Elaboration of Private Law Principles. Chapter 1 Private Law Principles, Pluralism and Perfectionism, Martijn W. Hesselink. Chapter 2 General Legal Principles Navigating Space and Time, Joxerramon Bengoetxea. Chapter 3 Emerging European General Principles in Private Law, John Temple Lang. Part II: The Constitutionalization of Private Autonomy. Chapter 4 Regulated Autonomy between Market Freedoms and Fundamental Rights in the Case Law of the CJEU, Guido Comparato & Hans-W. Micklitz. Chapter 5 European Law versus Private Law: Transformation or Deformation of the Paradigm?, Marek Safjan. Chapter 6 Horizontal Effect of Fundamental Rights: In Search of Social Justice or Private Autonomy in EU Law?, Dorota Leczykiewicz. Part III: Horizontal Direct Effect. Chapter 7 The Concept of (Direct and Indirect) Horizontal Effect of EU Law:The Terminology of European Law Scholars and of Private Law Scholars Compared, Arthur Hartkamp. Chapter 8 The Expectation of Legal Certainty and Horizontal Effect of EU Law, Juha Raitio. Chapter 10 General Principles and the Charter in Private Law Relationships:Constructive and Critical Input from Private Law, Carla Sieburgh. Chapter 11 The Horizontal Direct Effect of the Four Freedoms: From a Hodgepodge of Cases to a Seamless Web of Judicial Protection in the EU Single Market?, Sybe de Vries & Robert van Mastrigt. Chapter 12 What Purpose Does Article 16 of the Charter Serve?, Peter Oliver. Chapter 13 The Principle of Effectiveness and EU Private Law, Norbert Reich. Chapter 14 Remedies under the EU Charter in the Context of Disputes Arising in Private Law, Angela Ward. Part IV: Competition Law and General Principles. Chapter 15 From Regulation 17/62 to Article 52 of the Charter of Fundamental Rights, Ian S.Forrester. Chapter 16 Judicial Review after Menarini: Any Need for Reform of the EU System?, Helene Andersson. Chapter 17 Data Mirroring during Dawn-Raids: Right to Judicial Review, Ingeborg Simonsson. Chapter 18 How General Should General Principles Be? Ne Bis in Idem in EU Competition Law, Wouter Devroe.